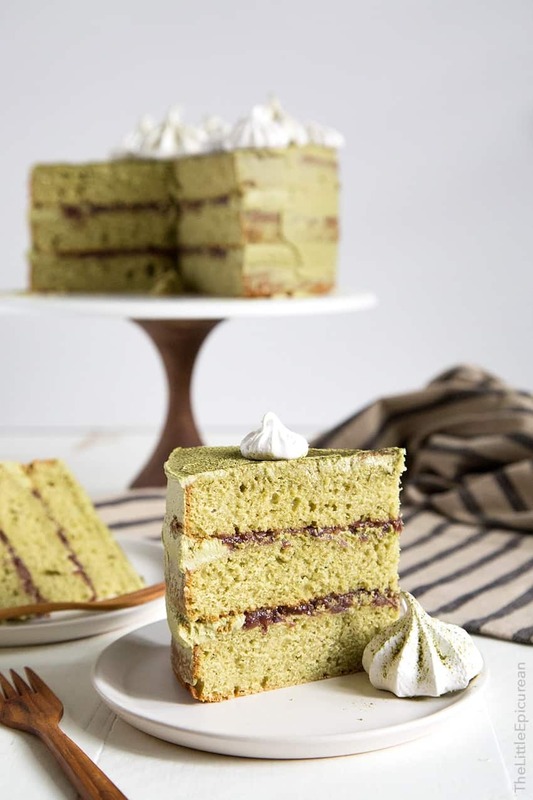 Matcha red bean cake: three layers of honey matcha cake filled with sweetened red bean paste and lightly coated with matcha buttercream. I thought I had my fill of matcha while I was in Japan. Apparently, that wasn’t enough. I’ve been making myself a mug of matcha every morning. One, because I absolutely love the way it tastes. Two, because if I close my eyes while sipping on the tea I can pretend for a few seconds that I’m still on vacation. My love for matcha is no secret. Just my check my cupboards. It’s overflowing with all sorts of matcha powders, candies, cookies, etc. (And obviously, my freezer is ALWAYS stocked with matcha ice cream… you know, just in case.) Also see: matcha mochi waffles, matcha mousse cake, matcha red bean s’mores. While I’m a big fan of the matcha & red bean (matcha & azuki) combo, Alex is still warming up to the idea. 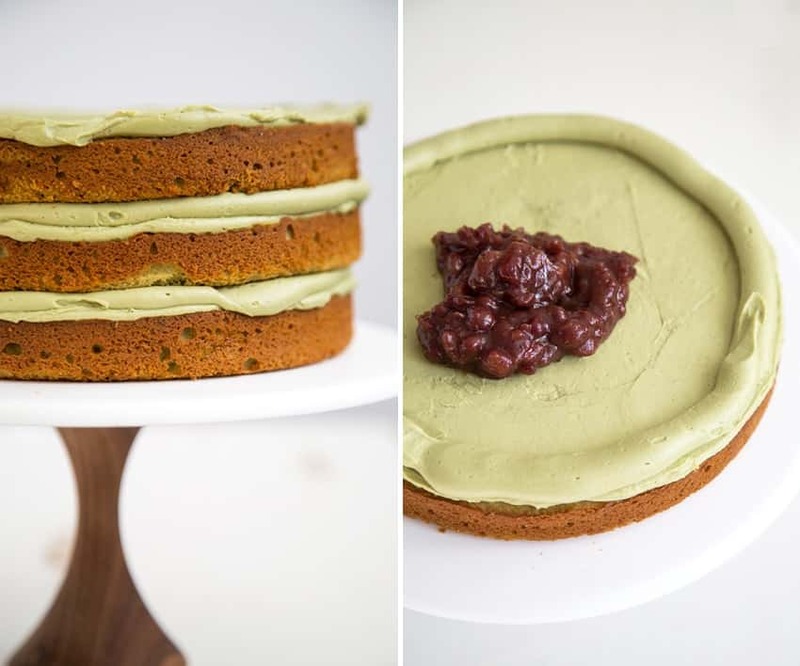 Since I want him to like EVERYTHING I like (including Gilmore Girls, 90’s R&B, and HGTV), I set out to create a matcha red bean cake that he would happily devour if fat and calories were not an issue. Matcha and red bean is to Japan as peanut butter and jelly is to America. It’s a widely popular flavor you’ll encounter all over Japan (and the rest of Asia). While I grew up eating sweetened red bean (in ice cream, milky bread buns, dessert soups,etc), Alex is fairly new to it. He still needs a little convincing. I understand. Beans in a dessert? The idea is a bit strange, but I assure you, it’s fantastic. 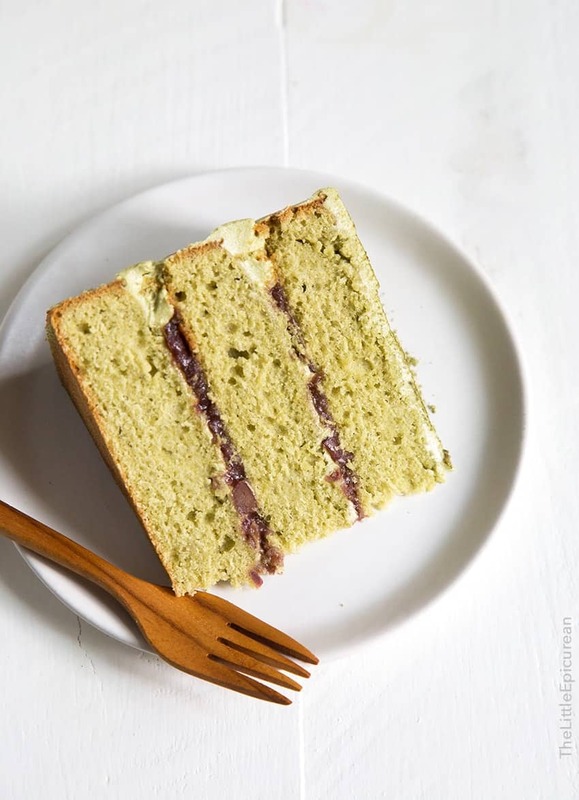 I stacked three layers of honey matcha cake filled with a thin layer of matcha buttercream and a thin layer of sweetened red bean paste. Rather than generously coat the cake with frosting, I opted for a very thin layer just to seal in the crumbs. 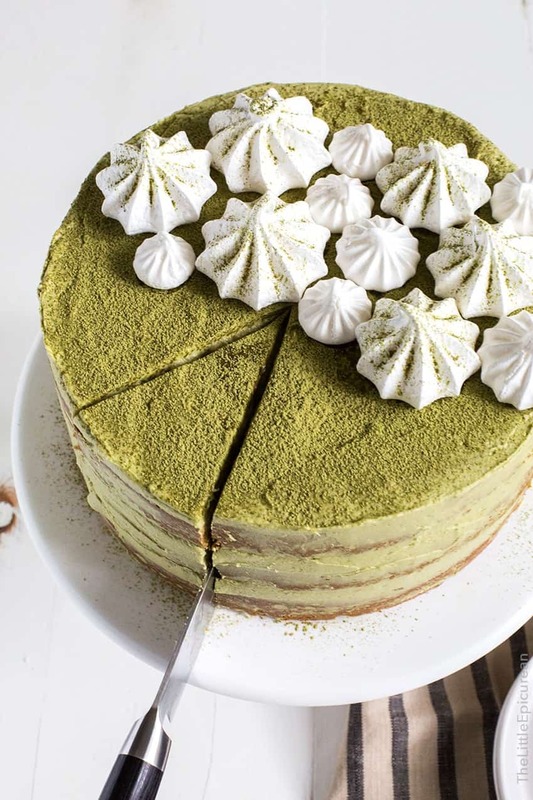 I dusted the top of the cake with a light sprinkling of additional matcha powder to enhance the matcha flavors. Since I had some extra egg whites from another baking project, I made meringue cookies. I used the meringue cookies recipe from Bakers Royale. They’re the perfect little cake toppers. Plus, it adds a much needed crunch to this otherwise soft dessert. I’ll be snacking on this matcha red bean cake while I slowly filter through all my photos and videos from my Japan trip. 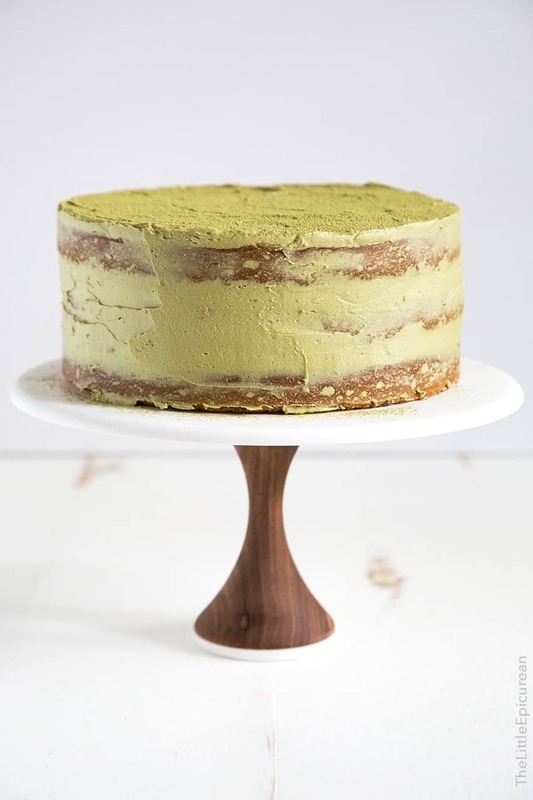 Three layers of honey matcha cake filled with sweetened red bean paste and lightly coated with matcha buttercream. Preheat oven to 350 degrees F. Lightly grease three 8-inch round cake pans and line with parchment paper. Set aside. In the bowl of a stand mixer fitted with a paddle attachment, cream butter. Add sugar and mix until incorporated. Add sifted matcha powder and mix until combined. Scrape down bowl as needed to ensure thorough mixing. Add honey. Add eggs one a time, mixing on low speed until incorporated. In a large bowl, whisk together flour, salt, and baking powder. Add flour mixture in three additions, alternating with buttermilk. Start and end with flour mixture. Mix until just combined. Be careful not to overmix. Divide cake batter among the prepared cake pans. Level batter, if necessary. Bake for 30-35 minutes until toothpick inserted in center of cake comes out clean. Allow cake to cool in pan for 3-5 minutes before unmolding. Allow cakes to cool to room temperature on wire racks. In the bowl of a stand mixer fitted with a paddle attachment (or using a hand mixer), cream butter until smooth. Sift together powdered sugar and matcha powder. Add to bowl in three additions. Mix on low speed after each addition. Add salt and milk. Mix until combined. Adjust consistency according to your personal preference. If buttercream is too thick, add milk 1 Tbsp at a time until desired consistency is achieved. If buttercream is too thin, add 1/4 cup sifted powdered sugar (up to 3/4 cup). Set aside until ready to use. Place sweetened red beans in a small bowl. Coarsely mash some of the red beans with a fork or the back of a spoon. Set aside. Level cake rounds, if necessary. Place one cake layer on serving plate or cake stand. 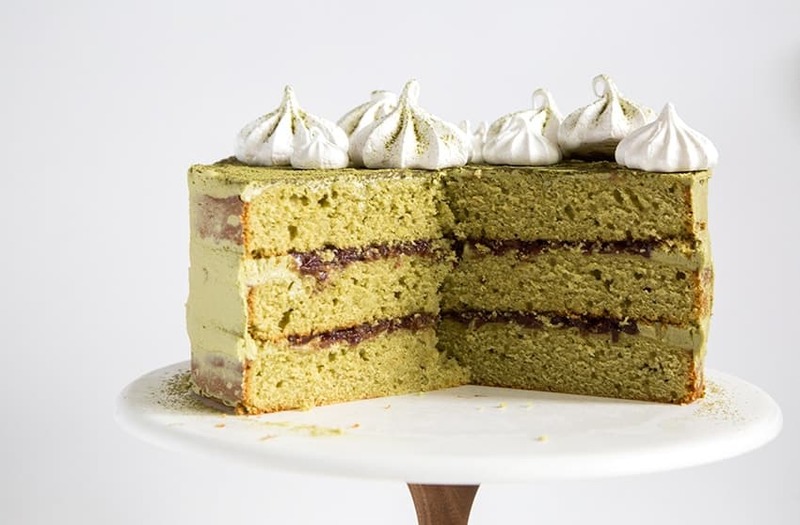 Spread a very thin layer of matcha buttercream over cake. Pipe a border of matcha buttercream along the perimeter of cake. Spread half of red bean paste within the buttercream border. Repeat with second cake round. Top with third cake round. Spread thin layer of buttercream around the exterior of cake to seal in any crumbs. Keep chilled in the fridge until ready to serve. Allow cake to sit at room temperature for 15-20 minutes before serving to soften. 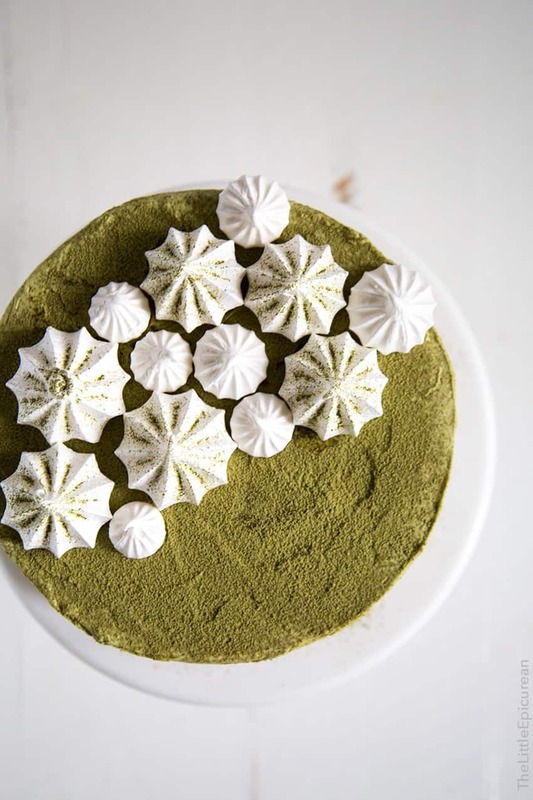 Before serving, dust the top of cake with sifted matcha powder. 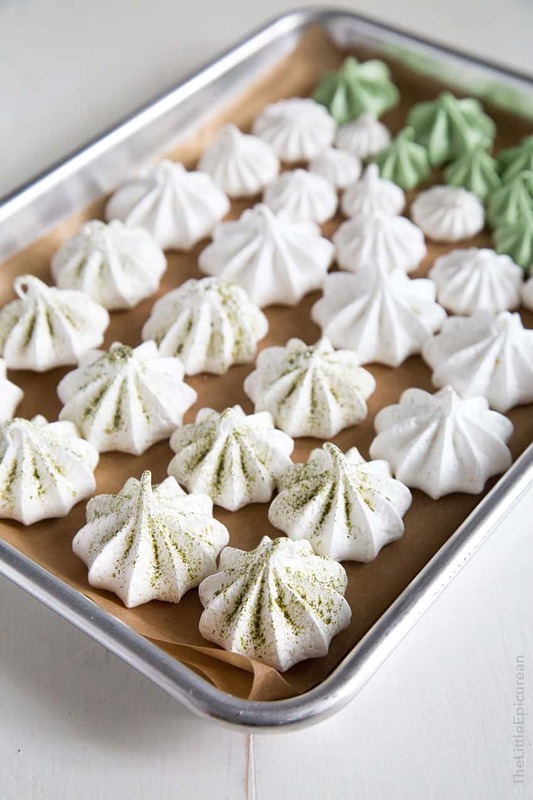 If desired, decorate the cake with meringue cookies*. This is the cake stand I used. i love this combo! 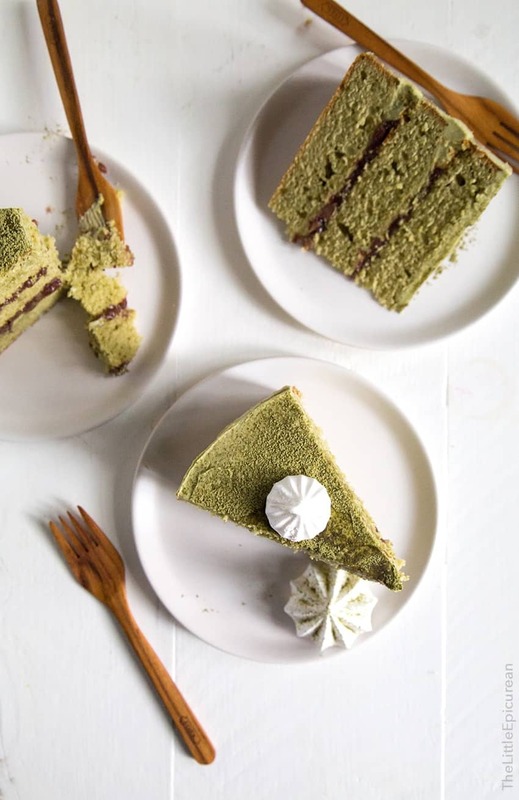 i haven’t made many desserts with matcha and azuki beans, but i really need to (and then i can get everyone who eats my desserts into those flavors too! hehe). This cake is screaming my name Maryanne! Do you still have something left? ;-) I love matcha and I love red bean, and together I love it even more. Thanks for sharing this recipe! Thanks so much Joleen! :) Matcha is the BEST! Love, love matcha and azuki beans combo in any form. Thanks for sharing the recipe! Hey dear, would like to ask if I do not have 3 different cake pans, can I just bake the mixture in one 8-inch cake pan and later split them in three? Baking all the cake in one cake pan will change the baking time. You would need an 8-inch cake pan that is over 3-inches deep. If you don’t have three 8-inch cake pans, I would suggest baking it in two-9 inch pans or one- 10 inch pan. I hope that helps. I would like to ask if you have this recipe converted to grams? May I know if 1 cup of unsalted butter means 8oz of butter? Can you make these as cupcakes and fill the red beans inside and frost with matcha on top? I haven’t make this into cupcakes, but I’m sure it would work!